Recently we blogged about what it’s like to move to York – with museums a plenty, history around every corner and day trips, parks and high living galore. 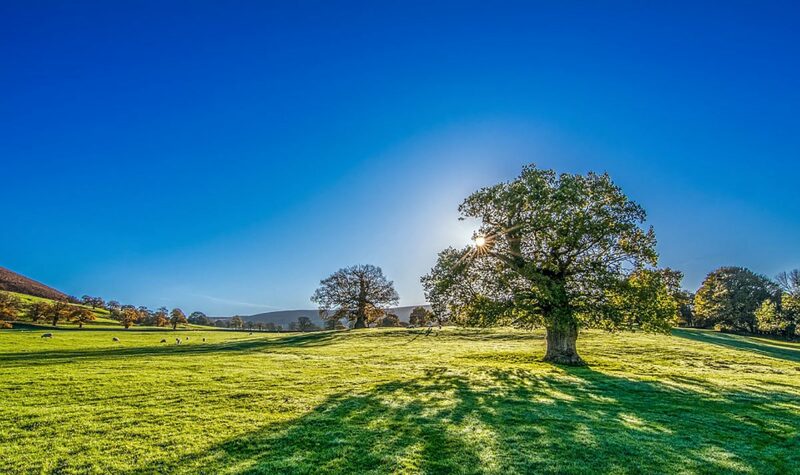 Yet for most there’s an elusive region out of financial reach – a glittering collection of Yorkshire towns and villages that are pulling in some of the richest people in the UK. We talk, of course, of the Golden Triangle. Located between Leeds, Harrogate and York, this cross section of areas serve as an exciting, prosperous and cosmopolitan draw. Here we take a look at why, and how some regions within Yorkshire are hot on the heels of the region’s most prestigious postcodes. Stunning homes, excellent schools, great infrastructure and some of the most diverse shopping in the region; these advantages to Yorkshire’s Golden Triangle are just the beginning when it comes to what this region of Yorkshire offers. Amongst this area are clear winners when it comes to high-end property – with some of the most expensive including the towns of Wetherby and Tadcaster, and villages such as Weeton, Appleton and Hammerton. 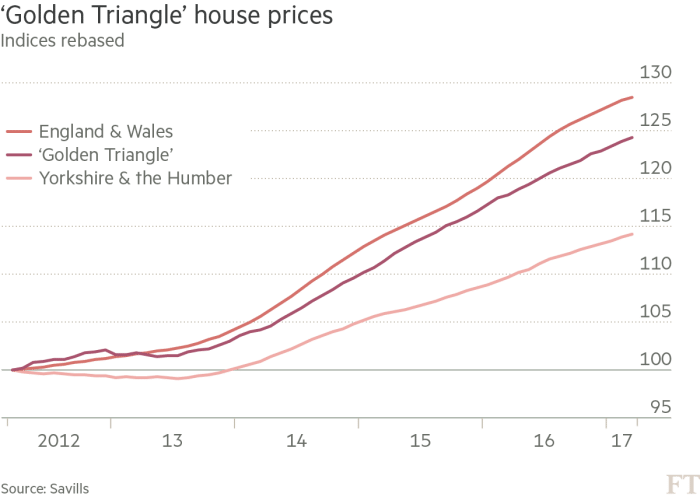 The average home within the Triangle comes in at £280,000, an amount that’s around two-thirds of the London average. Yet these prices have and continue to buck all trends – as the graphic from the Financial Times goes to illustrate. The Golden Triangle continues to draw big names in terms of the businesses hoping to set up shop here. Take, as a prime example, Rolls Royce. Rolls Royce will be an additional name to add to a red-carpet list of brands in the area – with Michelin Starred chefs being drawn to the area including Andrew Pern. These culinary hotspots often complete a night following an evening at the Opera North, the Northern Ballet, or the West Yorkshire Playhouse. The Golden Triangle has long since reigned supreme for those with the highest of aspirations when it comes to their home. Yet there seems to be another contender now vying for the crown – located in the north area of York, between the A19 and the A64. “Over to the other side of the A1 is an area that is less well known and certainly less expensive. If you want postcodes, we are talking YO60, YO61 and YO62. I would say that it is a golden trapezium, but that does not trip off the tongue quite as well as a triangle. “It has glorious countryside, the Howardian Hills; lovely estate villages like Coxwold, Hovingham and Terrington; market towns including Malton, Thirsk, Easingwold and Helmsley; mainline rail connections at Thirsk and Malton; excellent state schools at Ryedale and Easingwold, and for those so inclined, a leading private school at Ampleforth. “Access to York is, at most, half an hour from any corner of the patch”. As to whether this region will truly capture the throne and attract the earnings of the richest in the area, we can only wait and see. Making the move in Yorkshire, but not quite to the dizzy heights of one million pound + apartments? Thankfully you don’t have to be superrich to afford our York house removals service. Our service is second to none, and our rates are affordable.